In the coastal areas of Florida and the rest of the United States, many residents and visitors enjoy boating throughout the oceans, gulfs and other water ways. Boating, however, is an investment, and one that needs protection. At Five Brothers Insurance, we can provide you with a boat insurance policy to meet your every need. As a well-respected, family owned and operated insurance agency, you will always get the personal attention you deserve when you work with a Five Brothers Insurance agent. Each of our policy holders enjoys a personalized insurance plan perfectly suited to meet their unique coverage needs. Towing Policies: Get a policy with towing coverage to offset towing costs should you find yourself stranded at sea or needing to tow your boat back to a dock for repair. Liability Only Policies: Your basic watercraft insurance policy, liability only policies are a low cost and affordable option for protecting your investment. Cash Value Policies: Cash value policies will compensate you for the total market value of your boat should you suffer a total loss. 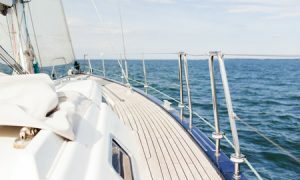 Most boat insurance policies will include salvage, medical, fuel-spill, wreck removal and other basic coverages, while other, more comprehensive policies can provide you with your exact hull value, cash value and more. Your insurance agent will be able to determine your policy eligibility and help you discover your true coverage needs. If you have been looking for a reputable insurance agent who serves Tampa, St. Petersburg, Clearwater, Sarasota, Bradenton and surrounding cities, contact Five Brothers Insurance today for boat insurance quotes, policy options and more. At Five Brothers Insurance, you are treated like family.